That’s right — for the first time ever, Canadians can enjoy an easy, direct flight to Daytona Beach International Airport. In fact, Sunwing is the only Canadian carrier to offer direct flights to Daytona Beach, so this is a very exciting announcement indeed. To start, the flights will be offered on Mondays and Thursdays, which is absolutely ideal for a long-weekend winter getaway to the beach! The announcement of the new flight comes as a result of the long-standing popularity of the Daytona Beach area in the Canadian market. People living in the Toronto area love to visit Daytona Beach’s 23 miles of expansive beaches and soak in the warm Florida sunshine, and this new offering makes it even more effortless. 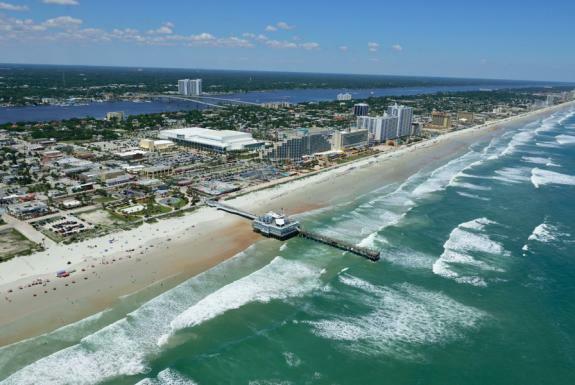 Daytona Beach has been a longtime favorite for winter getaways, and with good reason. It’s safe to say that winter in Daytona Beach is somewhat milder than the winter in Toronto. A week (or more!) at the beach is the ideal way to thaw out and refresh during some of Toronto’s coldest months. Parkas are traded for picnic baskets, and scarves are swapped with sunhats. Sometimes, a winter reprieve is exactly what the doctor ordered. Whether you’re paddling along the inlet, savoring fresh seafood, strolling along the beach at sunrise or experiencing an outdoor art festival, the fun in Daytona Beach runs deep and wide — no matter where you’re from! Although the area certainly holds fun for all ages and interests, beach lovers in Toronto can expect special incentives to come visit in the coming winter. Sunwing will offer a wide variety of resort package deals in conjunction with Daytona Beach businesses — and that means excellent value for your next vacation! In fact, Sunwing has a reputation for providing low-cost airfare and exclusive deals to its customers, and that feature will be extended to those desiring to make a break for the beach. So mark your calendars and let the countdown begin — a winter beach getaway is right around the corner! Go ahead and start perusing oceanfront hotel accommodations, exploring the endless outdoor adventures and adding all the best historical sites to your itinerary. January, we’re ready for you!